While a child is a symbol of innocence and purity, he may be trapped in the throes of obesity and sometimes even from a very early age, which is likely to have an important effect on his future adult life . Why is this? Who is to blame? and how can this spread of overweight be contained? These are the types of questions that preoccupy researchers and paediatricians. Problem: the answers are multiple and complex. A look at some of the possible solutions. If throwing a glance in a school playground is not enough, the figures are revealing. In the UK, weight excess affects a large section of the child population, among which a smaller part is obese [ 1 ]. The actual figures have practically doubled between 1980 and 2000.
Who is to blame ? The list is long, and there are many potential interactions between these different causes. To try to have a clearer view and so as to study the possible impact on the health of adults of changes in the feeding habits at the time of adolescence, a five year research program was set up in 2005, bringing together 16 European countries. The Early Nutrition Programming Project, which was presented at the Fens congress in July 2007, is coordinated by Berthold Koletzko of the University of Munich (Germany). In the opinion of Koletzko: The importance on the long-term health and the wellbeing of an adult depends to a very large extent on the nutrition of the baby in the first months of its life." A high and early weight gain multiplies by two or three times the risk of obesity at school age and adulthood [4 - 6]. In the light of the latest clinical and epidemiologic studies, there is an emerging trend associating such postnatal effects to the prenatal causes to the metabolic determination of health at adulthood. Acting at the nutritional level of the formula milk's composition . Research research in developmental biology and cancer shows, for example, that obvious changes in food supplies in polyunsaturated fatty acids of the Omega-6 and Omega-3 series appeared during the four last decades. In the general population, the data shows an increase of 40% in the consumption of lipids, which leads to an even more important increase in the contributions of fatty acids from the Omega-6 series, present in many foods (respectively + 250 and 230% for the linoleic and arachidonic acids). At the same time, the contributions in alpha-linoleic acid (omega-3 series) fell by 40%. This results in a fourway Omega-6/omega-3 ratio , not only in breast milk but also in the majority of foods consumed by children and adults, with metabolic consequences that have begun to appear in recent surveys: increase of inflammatory and auto-immune diseases and certain cancers [ 7 ]. 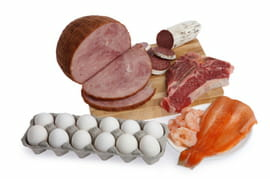 Omega-6 fatty acid of animal origin are found in whole eggs, butter, cod-liver oil and animal fats. But it is especially true for animals, and it is that which most excites the experts, that Omega-6 fatty acids stimulate adipose tissue development by favorising the formation of lipocytes , in particular during the period of gestation and lactation. If such were the case for man, it would explain, at least partially, the current increase in the growth of obesity, in particular in children [ 8 ]. While Lipids are always responsible, proteins also share part of the blame, at least as far as childhood obesity is concerned. The theory is based on the fact that a rapid weight gain at the beginning of life and early swings in adiposity are associated with a high risk of obesity . In conclusion, the majority of obese persons had adiposity swings around the age of three, compared to the age of six in the reference population [ 9 ]. Together with these observations, the positive protective effects of breast-feeding was noted. This can be explained, in part, by the inclusion of macro-nutrients in its composition, distinguished by a small proportion of proteins and a high amount of lipids, a composition which meets the nutritional needs of the young child. On the other hand, the data collected for babies approaching the age of one reveals only a weak contribution in lipids but a correspondingly high contribution in proteins. As a consequence recent studies have tried to evaluate the effects of this misbalance in macronutrients on the potential risks for obesity. Although some studies showed a positive association, not all converged in this direction so much research still needs to be done. From a nutritional point of view the energy requirements vary with age, so it appears logical to adapt the contributions according to these needs, although, for the moment, this does not seem to be the case. Indeed, the evolution in the distribution of the nutrients with the age shows that at the very beginning of life the contributions in lipids represents only 28% of the energy requirements, but then increase up to 38% by adulthood, exceeding the recommended level of 35% [ 10 ]. As the number of causes of obesity increases, it appears far too complex to try to eradicate the causes of childhood obesity even though the onset of later obesity, with all its physiopathological consequences, can often be predicted quite accurately. The solution: to act at each stage. Initially, we must try to rebalance the food chain's Omega-6/omega-3 ratio. This implies the need to begin at the beginning of the agricultural food chain, which determines the quality of the animal feedstock, and eventually that of man. Rebalancing the amounts of macronutrients in order to allow children to have a normal growth pattern and to become healthy adults by respecting the nutritional recommendations at the various stages of growing up. . This presupposes an active participation by the manufacturers of food additives, which must be induced to modify their formulations, just as mothers in Europe must be encouraged in their breast feeding habits. Such actions must be enhanced with recommendations on how to improve one's lifestyle, such as replacing sedentary "couch potato" activities such as video games, television. with more energetic activities involving physical exercise, not only for children, but also for adults. The importance of reacting at the first signs of overweight in a child, and even, of highlighting the risks involved in being overweight . Indeed, he explains: " More than 50% of obese 6 year olds will remain obese into adulthood, just as 70 to 80% of obese 10 year olds will be at adulthood. The more obesity is prolonged during childhood, the more likely it is to persist into adulthood." But according to Patrick Tounian it is necessary to target the treatment of obesity essentially on children at risk. It is important that a doctor detects the disorder early enough that a programme of immediate treatment can be initiated. On the otherhand, it serves nothing to treat children who are not predisposed to obesity and could even have the adverse effect of inducing behavioral eating disorders in such children. "We must instead focus prevention on children at risk, which involves early detection by doctors who will then establish an immediate care procedure for the child"
The presence of overweight or diabetes in the family, a excess ponderal during the first two years of life, as well as the time spent in front of television (exceeding one hour per day) was associated conclusively with overweight. The identification of such factors would permit a better diagnosis of the children at risk and so help to act preventively. Rolland-Cachera MF, CastetbonK, Arnault N, Bellisle F, Romano MC, Lehingue Y et al. Body mass index in 7-9-y-old French children: frequency of obesity, overweight and thinness. Int J Obes Relat Metab Disord 2002; 26:1610-1616. Arenz S, Rückerl R, Koletzko B, von Kries R. Breast-feeding and childhood obesity--a systematic review. Int J Obes Relat Metab Disord. 2004 Oct; 28(10):1247-56. Baird J, Fisher D, Lucas P, Kleijnen J, Roberts H, Law C. Being big or growing fast: systematic review of size and growth in infancy and later obesity. BMJ. 2005 Oct 22; 331(7522):929. Epub 2005 Oct 14. Monteiro PO, Victora CG. Rapid growth in infancy and childhood and obesity in later life--a systematic review. Obes Rev. 2005 May; 6(2):143-54. Massiéra F, Guesnet P, Ailhaud G. Omega 6/omega-3, quel rapport avec l'obésité de l'enfant ? Actes des 9èmes Entretiens de nutrition de l'Institut Pasteur de Lille, 6 juin 2007. Ailhaud G, Massiéra F, Weill P et al. Temporal changes in dietary fats : role of n-6 polyunsaturated fatty acids in excessive adipose tissue development and relationship to obesity. Prog Lipid Res 2006; 45:203-236. Rolland-Cachera MF, Deheeger M, Maillot M, Bellisle F. Early adiposity rebound: causes and consequences for obesity in children and adults. Int J Obes [Lon] 2006; 30S4:S11-S17. [10 ] Rolland-Cachera MF, Péneau S, Bellisle F. Protéines et nutriments énergétiques : quelle répartition pour la croissance ? Actes des 9è Entretiens de nutrition de l'Institut Pasteur de Lille, 6 juin 2007. Latest update on July 1, 2015 at 04:54 PM by Ambucias. This document, titled "Why do Children Become Obese," is available under the Creative Commons license. Any copy, reuse, or modification of the content should be sufficiently credited to CCM Health (health.ccm.net).